That’s what Live & Local hostess Lauren McDonald was chanting (or was it gasping?) as she took Rush Cycle for ‘a spin’ at our newest location in Colorado Springs. Owner Josh Hurwitz was grinning from ear to ear, and he wasn’t the only one. McDonald’s wit and curiosity about just how Rush Cycle works, and what makes it different, was charming everyone she talked to. 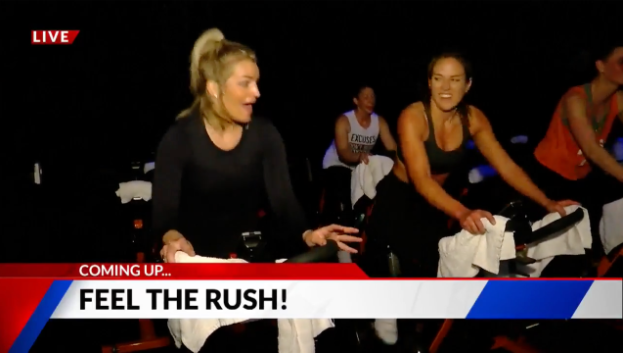 The 20 minute segment features lead instructor Ashley sharing what makes Rush Cycle so fun for people of all experience and fitness levels. “It feels more like you’re at a nightclub than a spin studio!” McDonald explained after she stepped out of her first class. Our total body approach, with dumbbells, dancing, and themed music has already won many hearts in Colorado Springs. Lead instructor Ashley shared another reason Rush has been such a hit within the community. “Whether you’re brand new, you’ve been spinning for a while, or you’re an elite athlete, you can get a rewarding workout here.” Ashley explained. It’s more than the workout that people are coming for. Community is a huge part of what we do, and we’re proud to say that our new Colorado Springs location has that down to a tee. “Even if you’re a new rider, you’ll be welcomed here as part of the community right away.” Owner Josh Hurwitz assured the crew. For an inside look into this new Rush location and the Rush experience, watch the full segment below. Be sure to also check out our Highlands location for cycling classes in Denver.